The remainder of the New York Giants’ 2018 season seems to be shaping up to be an all-out sprint for the top pick in the 2019 NFL draft. 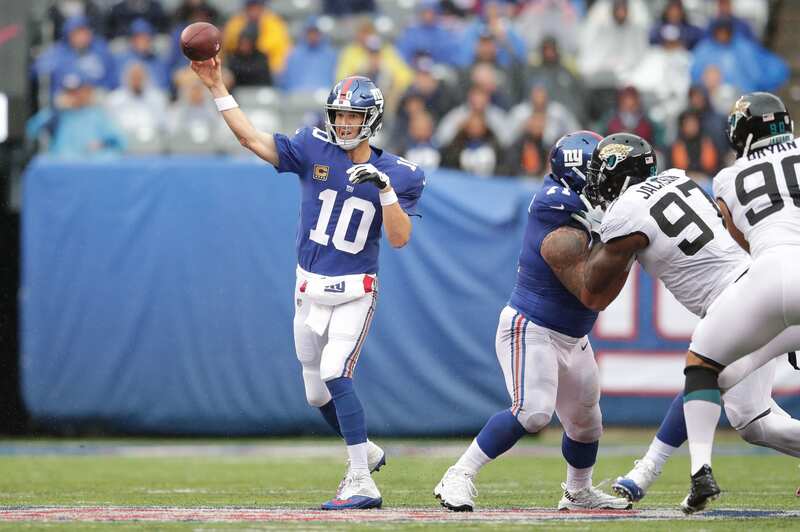 Most would imagine that the Giants would be fighting for mere pride at this point, but we know that at 1-5 will likely result in a lack of effort and bad performances. So, what exactly do we have to expect for the rest of the campaign for the New York Giants? To start off, we can assume head coach Pat Shurmur won’t make any developmental decision until the Giants are mathematically eliminated from the playoffs. When I say developmental I mean starting a different quarterback and letting some of the younger players get more playing time. The 2018 season was assumed to be a bounce-back year from the 2017 season, and the demise of the franchise and locker room seems to have set the team back in terms of progress. The priority last offseason was to address positions of weakness and pray that the free agent signings would be enough to hold down the fort. The bottom line is that a majority of the signings have turned out to be busts (so far). Left tackle Nate Solder has struggled in pass protection consistently, right guard Patrick Omameh has been an abomination, wideout Cody Lattimer hasn’t made a significant impact, linebacker Alec Ogletree has been burned in coverage, and outside linebacker Kareem Martin hasn’t made a noticeable impact. These are just a few examples, but it’s also necessary to recognize the lack of familiarity between the players and the fact that most have come from vastly different systems and disciplines. I would expect most to develop within the system Shurmur and GM Dave Gettleman are trying to build. It’s improbable that both sides of the ball would come together as cohesive units in just one offseason. Despite the lack of influence from the FA’s, the draft picks have been excellent. Defensive lineman B.J. Hill has been a rock in the run game and has shown an ability to rush the passer, running back Saquon Barkley has been an absolute phenom, racking up 811 all-purpose yards, offensive lineman Will Hernandez is currently ranked as the best Giants’ lineman and one of the best guards in the league, and QB Kyle Lauletta has begun his development behind Eli Manning. The pieces are in place to foresee a successful future, but it comes down to the veterans on the team to hold things together as the growing pains ensue.